I found this article via Young Earth Creationists Anonymous. 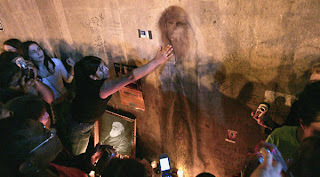 The article is about a stain believed to be in the form of Charles Darwin, which appeared on a wall in Tennessee. Coincidentally, the wall belongs to the courthouse which was used for the famous Scopes Monkey Trial. According to the article, believers in Darwinian evolution have been flocking to the wall from all over the United States to see the stain. "I brought my baby to touch the wall, so that the power of Darwin can purify her genetic makeup of undesirable inherited traits... Behold the power and glory of the scientific method!" said Darlene Freiberg. Others were not so impressed. "It's a stain on a wall, and nothing more," said the Rev. Clement McCoy, a professor at Oral Roberts University and prominent opponent of evolutionary theory. "Anything else is the delusional fantasy of a fanatical evolutionist mindset that sees only what it wishes to see in the hopes of validating a baseless, illogical belief system. I only hope these heretics see the error of their ways before our Most Powerful God smites them all in His vengeance." Are you so silly as to not recognize that this is a spoof on your silly stains on cloth / walls, Jesus shaped potato chips? They are making fun of you tongue talking bible thumping nut-cakes! Wow.... is that guy calling me a "bible thumping nut-cake"? Is he calling me silly for not recognising what this is?